I am not the poster child for positive thinking. My proverbial glass is frequently leaking. But, it is something that I am working on. Every night, I make a concerted effort to find some moments to thank God for. It has helped my general outlook tremendously. Muto discusses the benefits of positivity as well as the dangers of negativity, offering practical ways to quiet the negative voices inside our heads. 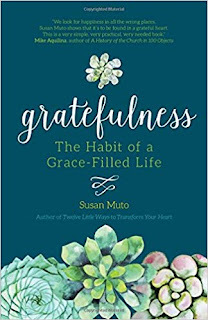 She also explores the signs that we are making progress in grateful living as well as the lasting fruits of thankfulness. In addition, each chapter profiles two saintly companions in grateful living, providing role models for us to imitate. There are also reflection questions for private or group use. The Conclusion offers 12 tried-and-true ways to foster receptivity to and cooperation with the grace of gratefulness. The Appendix could actually be considered a bonus book. Muto includes 21 reflections which could be used as a self-guided retreat. “Counsels on the Grace of Gratefulness: Twenty-One Days with the Ancient, Medieval, and Modern Spiritual Masters” features short biographies of each spiritual master, followed by a quote by them and reflection questions. If you want to embrace a more grateful spirit, Gratefulness: The Habit of a Grace-Filled Life will help you on your journey.